Preheat oven to 350 degrees and spray and 8x8 baking dish or 9-inch cast iron skillet with cooking spray. In a large bowl whisk together the softened cream cheese, yogurt, Mr. Spice Hot Wing Sauce, garlic powder, and onion powder. 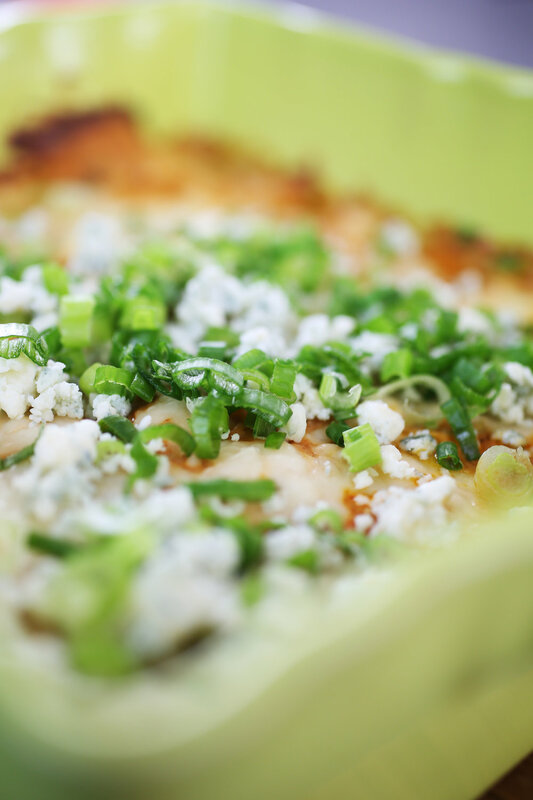 Fold in the green onions, chicken, 1/2 cup shredded mozzarella cheese, and 2 tablespoons of the blue cheese. Pour the mixture into the prepared baking dish or cast-iron skillet and top with the remaining 1/2 cup of shredded mozzarella. Bake for 30 minutes or until bubbly and golden on top. Remove from the oven and top with the remaining blue cheese crumbles and more green onions if desired. Heat oven to 450 degrees. In large mixing bowl whisk flour, water, garlic powder, salt, and pepper. Add cauliflower pieces and toss until evenly coated. Drizzle olive oil evenly over baking sheet. Place coated cauliflower pieces on baking sheet and bake for 15 minutes turning once. In large mixing bowl, whisk melted vegan butter and Mr. Spice Hot Wing sauce. Take cauliflower out of oven and add to mixing bowl with sauce tossing lightly to coat. Spread cauliflower out on baking sheet and place back in oven for 25-30 minutes flipping a few times so you get a good crispy edge on all sides. Serve with vegan ranch and celery sticks. Enjoy! Mix all ingredients together. Form into a loaf. Place on a rack in a shallow baking dish. Bake in 350 degree oven for about 45 minutes, or until the center is done when checked. NOTE: Nice to serve with rice, parsnips, or your favorite pasta. Marinate the steak in a mixture of the lime juice and MR. SPICE HOT WING! SAUCE for at least 8 hours, turning every few hours. Remove the steak from the marinade. Save marinade. * Broil the marinated steak 2 to 3 minutes on each side, until desired tenderness is achieved. Slice the steak, cross-grain, into thin slices. Serve the sliced steak on top of 8 tortillas, with the remaining ingredients layered on top. *Heat reserved marinade. Drizzle over assembled fajitas. Sauté the celery, onion, and garlic clove in the chicken broth until soft. Add the tomatoes, tomato paste, and the bell pepper. Cook for 5 minutes. Add the chiles, mushrooms, tomato juice, and the MR. SPICE HOT WING! SAUCE. Simmer another 5 minutes. Add the remaining ingredients and cook for at least 1 hour. Serve hot in deep soup bowls. Garnish with a sprinkle of shredded low-fat cheddar cheese. Place the flounder fillets in a shallow pan that has been sprayed with PAM®. Combine the remaining ingredients and spoon over the fillets. Cover and bake in a 400 degree oven for 10 to 15 minutes. Place the fillets on a serving dish and drizzle with the pan juices. Serve immediately. NOTE: Analysis based on a 2-ounce portion of flounder. Combine the ingredients and mix well. This is excellent served over your favorite tossed salad. Bake the potatoes in a 450 degree oven for about 45 minutes, until tender. Split lengthwise. Scoop out insides. Whip together the potato insides, skim milk, and egg white. Add in the spinach. Place the mixture back in the skins. Sprinkle the cheese on top. Drizzle a small amount of MR. SPICE HOT WING! SAUCE over the entire potato. Broil until the cheese is melted. Sauté the onion and green bell pepper in 2 tablespoons of the chicken broth. Add the tomatoes, remaining chicken broth, pasta, and MR. SPICE HOT WING! SAUCE. Boil for 5 minutes. Pour into a 2 quart casserole dish that has been sprayed with PAM®. Arrange the chicken on top of the ingredients already in the casserole dish. Bake, covered, in a 350 degree oven for 35 minutes. Sprinkle cheese, on top. Let stand 5 minutes or until cheese is melted.